Maintaining or returning to good health involves more than medical matters. It involves accepting chronic kidney disease, learning to live with it, and getting on with your life. To adjust to living with kidney disease, you are going to need the help and understanding of your family, your friends, and your healthcare team. But, the most important person is YOU, the person with kidney disease. The impact kidney disease has on your life depends on you. If you let kidney disease rule your world, it will. Learning to live with chronic kidney disease. Staying healthy and enjoying life. For many people, discovering that their kidneys have failed comes as a great shock. For others who have known, for years, that they have kidney problems, it is perhaps less of a shock. But still, being told you have end-stage kidney disease is never welcome news. It takes time to accept this fact and to adjust to it. Many people go through a number of emotional stages after being told their kidneys have failed. Of course, not everyone goes through the same stages, or in the same order. These stages may include denial, anger, bargaining, depression, and acceptance. Read the following descriptions and see if you recognise any of them. You will be happy to know that, with time, most people adjust emotionally to chronic kidney insufficiency and return to their former outlook on life. At first, many people deny they have chronic kidney insufficiency and might need kidney replacement therapy. They cannot believe this is happening to them. Some are convinced that, somehow, the laboratory has mixed up their blood test with someone else’s. For many, this is the first chronic, irreversible disease they have ever had to face, and they are not able to accept it right away. The people who have the most difficulty accepting their diagnosis are usually those who have had the least warning. One day they may be feeling fine; the next day they are told their kidneys have failed. That is a big mental hurdle to overcome. Those who have the least difficulty are usually those who have known for years that this was a possibility and have prepared themselves, emotionally, for this day. With time, most people get over this stage and accept that their kidneys are failing or have failed. 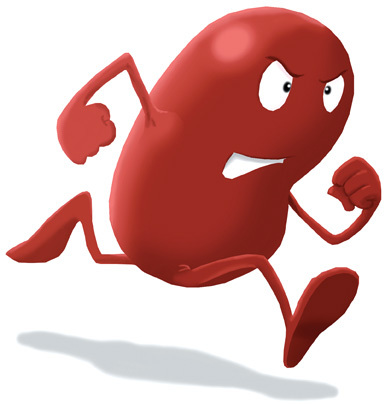 Anger is a common response for many people when told their kidneys have failed. They are angry at themselves for getting sick or angry at their doctor because the problem was not diagnosed sooner or cannot be cured. Sometimes, they are angry at everyone, including their friends, family and healthcare team, simply because they feel angry. Of course, no one’s really to blame — not you, your doctor or anyone else. There is probably nothing you could have done to prevent the disease, and your treatment would probably have been the same, even if your doctor had diagnosed the problem sooner. This stage does not usually last very long. Anger fades, as you adjust to living with chronic kidney insufficiency. Most people respond to bad news by trying to bargain their way out of it. So it is not surprising that, when some people are told their kidneys are failing or have failed, they try to bargain their way out of the situation. They promise themselves that if they can have working kidneys again, they will go on a diet, exercise regularly, and give up smoking and drinking. Though these changes are likely to benefit your health, they will not change the diagnosis of kidney disease. Unfortunately, chronic kidney disease is one of those things you cannot bargain your way out of — no matter what you promise. At this stage, it is often helpful to find out everything you can about kidney disease and the different treatments. There have been recent advances in treatment strategies, for kidney disease, prior to kidney replacement therapy. There also have been advances in dialysis and transplant technology. There are many reasons why you should be able to live a productive and enjoyable life. Many people feel depressed when they discover their kidneys have failed. Even after treatments have started, and you are feeling much better physically, the thought of having regular dialysis, perhaps while waiting for a kidney transplant, might leave you feeling depressed. You may feel dependent, on others, for the first time and this may affect your ability to live the life you once enjoyed. Emotional support, from family and friends, may also decrease as the shock of diagnosis fades. Often, you might have difficulty accepting their support or they might not know how best to offer it. However, with time and increased understanding of kidney disease, people do adjust. Each person has different ways of adapting. However, if depression continues for some time, it is a good idea to speak to your healthcare team because depression can be effectively treated. Fortunately, most people learn to live with chronic kidney insufficiency. Although they would rather have healthy kidneys, they realise that, with the proper treatment and lifestyle changes, they will be able to live as usual. Acceptance does not always come quickly or without help. Many people find it useful to talk to someone besides family and friends about their feelings. If you feel you need a person to talk to, do ask a member of your healthcare team to recommend someone. It can make a big difference. Fear about the treatment, death, the future, the unknown. Anxiety about what to expect - prolonged periods of feeling uneasy and finding concentration difficult. Worry about how the treatment will affect your life, your plans, your future, your family. While most people will experience some or all of these emotions, the actual experience of being on dialysis is unique to each individual. The good news is that, after the initial shock, most people do come to terms with it and cope effectively in their own way. The more support and help a person has, the easier it is to adjust. Educate yourself – Find out as much as you can about dialysis and the treatment options available. Ask questions; the renal team is there to help you. It can be difficult to take it all in at first because there seems so much to learn. Seek support – Be prepared to talk about how you feel and your concerns. The renal team comprises members who can offer specialist advice and support, and their roles are explained in this book. Counselling is available for both you and your family and can be arranged by speaking to any member of the renal staff. Maintain relationships – Being on dialysis at first can make you feel ‘different’ from your family and friends. Remember that they do not know what to expect any more than you do. Talk to them and stay involved with them. Do not let dialysis take over your life – Yes, changes are inevitable, because adjustments have to be made to facilitate dialysis in your life. However, it does not mean you have to put your life ‘on hold’. Despite the restrictions on your time, stay involved as much as practically possible with yout other interests such as family activities, work, education, leisure pursuits. Take control – Take charge of yourself. Familiarise yourself with your treatment, your drugs, and your diet and fluid restrictions. They are prescriptions to keep you well, and if you work with them, rather than fight against them, they will help you cope and feel better. The Irish Kidney Association – Support from the patients’ association is very helpful and it is advisable to join. Even if you cannot actively attend local meetings, you can be informed about forthcoming events and other support services for patients in their quarterly newsletter. Healthy lifestyle – Do not forget the basics. Keeping well means taking care of yourself physically, emotionally, socially and spiritually. Eating well and healthily within your dietary restrictions, getting enough sleep, taking some exercise, getting fresh air and relaxation are all important. Also, not smoking and alcohol consumption, in moderation within the fluid/dietary restrictions, will all help you to cope. Seek help – If you feel unable to cope, talk to a member of staff and consider counselling. Counselling provides a one-to-one confidential opportunity to talk about your problems and receive help to cope. Counselling is available for you and your family. Yes, if you want to keep living. However, for some people who may be coping with other serious or chronic illnesses or have a poor quality of life due to illness, the option of dialysis might appear to offer prolonged suffering rather than relief. Dialysis is a treatment choice, not a cure for kidney disease. You have the right to choose not to go on dialysis, or to have dialysis for a trial period, to see how you get on with it. You have the right to stop dialysis if you feel it is not for you. kidney team is available to discuss all options with you.